SPIDER-MAN, ICEMAN, & FIRESTAR: THE SPIDER-FRIENDS! The animated television series Spider-Man and his Amazing Friends originally aired on the NBC network Saturday mornings beginning in 1981. 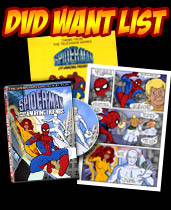 Though originally proposed as a show similar to the Spider-Man comic books, the network felt that Spidey needed some additional elements to make him accessible to a wider audience. Iceman (from Marvel Comics' X-MEN) and an original character, Firestar, were added as well as <shudder> a cute little dog for comic relief. Despite the network's intervention, the creators pulled off a wonderfully charming show that is fondly remembered by children of the 1980s as a classic. - Episodes available for purchase on Amazon Instant Video! - Kathy Garver & Dan Gilvezan interview at Spider-Man Crawlspace! - HAPPY 30th SM&HAF! Interview with writer DON GLUT!! - New interview with show designer RICK HOBERG!! - THE COMPLETE SERIES now on DVD from AMAZON.CO.UK! - If you have 16MM copies of the show, please e-mail me! - Please help to complete the STAN LEE NARRATION LIST ! The creators of Spider-Friends.com and the 1981 solo Spidey website have created a web site based on the 1982 Incredible Hulk cartoon. The cartoon originally aired on the NBC network in the fall of '82 along with Spider-Man and his Amazing Friends. The site includes a comprehensive episode guide, picture gallery and memorabilia – with more to come! Be sure to check it out at hulk.toonzone.net! The amazing Jon Talpur has concocted a wonderful site based on the 1981 solo Spider-Man cartoon. For those who don't already know, the solo cartoon shared many of the same designs and creators of The Incredible Hulk as well as Spider-Man and his Amazing Friends but the show is not as well known since it was not shown on a national TV network. Be sure to check it out at spider-man.toonzone.net! *All characters are property of Marvel Comics and are used without permission.